Commissioner for Trade and ­Industry Ambassador Albert Muchanga who noted that African heads of states have made the decision in Addis Ababa on Sunday. “The number one priority of AfroChampions Initiative is the African continental free trade area. After interacting with our government officials we have come to a common understanding to join hands to develop Africa. It is one of the flagship projects of African Union’s Agenda 2063,” Commissioner Muchanga said. “Immediately after the signing of CFTA, we have to go to the next stage of advocating for the ratifications of the law at national level. “We have teamed up with African Champions Club to give us five imminent business people so that they can join ten others from the public sector to go around all the five regions of Africa to lobby for rapid ratification of the legal instruments establishing the free continental trade area,” he said. “Once that is done and we have a minimum number of 15 then we move to the next stage which is actually giving it life. So that it becomes a legally operational instrument and we start doing the work. By doing so we are establishing an internal market of 1.2 billion people. 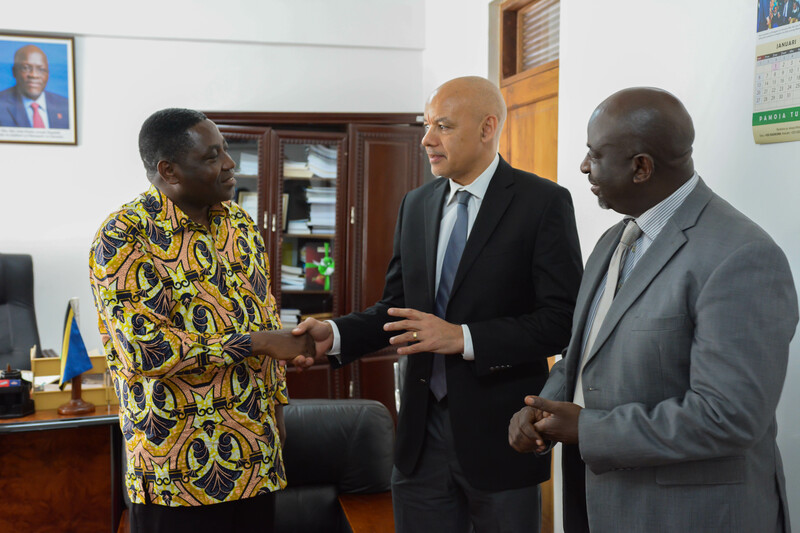 We would like the Afro Champions to be part of this market,” the Commissioner said. “The signing of CFTA on 21st March in Kigali Rwanda is a great step forward to realizing free continental trade,” said Ali A. Mufuruki, Deputy chair of AfroChampions Club and chairman of Tanzania based Infotech Investment Group. Report shows that African businesses investment share in the continent is only 12% members of AfroChampions Club includes the co-president and founding member Mr Aliko Dangote who, couldn’t be able to attend the meeting because of the reasons beyond his control, according to Mr Mufuruki who, indicated the need for African countries to produce more tradable goods and services that can be traded between and among different African countries. The members of AfroChampions Club includes the former President of South Africa, Thabo Mbeki and former President of Nigeria Olusegun Obasanjo who is serving the club as patron. “…The private sector in Africa means literally almost all of us. A lot of people think that the private sector is only made up of the so-called captains of industry – a handful of individuals running big businesses of a country. “But actually the definition of a private sector is everybody who is not employed by the government. All of a sudden more than 99% of the people in Africa become private sector. These are the people a lot of us depend on to succeed for those of us who do business and for whom our leaders are supposed to work,” Mr. Mufuruki said. “The harder task for us is not so much of easing the crossing of borders or speaking the same languages or being friendly to one another. The harder task is increasing our productivity; building industries and expanding our farming capabilities and building our human resource. That is so badly needed to build Africa, which require all of us to join hands and work together,” he said. Reflecting on the topic, United Nations Conference on Trade and Development UNCTAD Secretary General Mukhisa Kituyi on his part stated that the largest market for Africa is in Africa. “Nigerians do not need to buy Kenyan tea from London,” he said, applauding the decision made to sign CFTA in the coming March. For the past couple of decades, African leaders have been signing many protocols and declarations with an attempt to integrate Africa economically, socially and politically, which ultimately is supposed to improve the lives of the people of the continent. Meanwhile, critics say most of such declarations were either not implemented at all or poorly implemented failing to bring the envisioned result.